Visit great places whether single, married or a family of four. Deciding where to travel this summer can be tough, especially if you’re on a limited budget. But even if you’re strapped for cash, it doesn’t mean you have to put your travel plans on hold. Whether you’re single, married or part of a growing family, here are the best travel destinations that can accommodate your budget. Click through to read more about how to save on summer travel. Single: $750 — Sedona, Ariz. Flight cost: Roundtrip flights from LAX to the Phoenix Sky Harbor International Airport are currently around $100 for a weeklong trip in mid-August. But the airfare is about $100 higher if you land at the Flagstaff Pulliam Airport, which is closer to Sedona. Lodging: Whether you end up staying for a week or a quick weekend, the average price of a hotel is $36 per night. What to do: Sedona is not only a great travel destination if you’re traveling solo on a budget, it’s also a great place to spend time alone. Take in the breathtaking landscapes of the famous Red Rock Country with a hiking trail or two. Flight cost: You don’t have to stay local in order to afford a good time if you’re traveling by yourself on a budget. A roundtrip flight to Amsterdam is currently $740 for a 6-day trip in August, according to Google Flights. Lodging: You can snag a hotel room for as low as $134 a night through TripAdvisor. However, you might want to explore hostels, which start as low as $41. What to do: The Dutch are known for their affinity for riding bikes, so rent a bike and explore the city. Or take a trip to see the works of the iconic Dutch artist Vincent Van Gogh at the Vincent Van Gogh Museum, one of the most popular museums in the world. Flight costs: Currently, a roundtrip flight from LAX to Barcelona ranges from about $800 to a little over $900 for a six-night stay in late August. Lodging: If you have the money to spend, then book a hotel in the city for about $170 a night. But again, consider a hostel to save more money. A hostel might not come with the high-end amenities of a hotel room, but the price is much easier on your wallet. For instance, most hostels in Barcelona are offering a deal of $27 or more per person. What to do: Treat yourself with some retail therapy by visiting the age-old market Mercat de Sant Josep de La Boqueria. The vibrant colors and Spanish food makes this a favorite among travelers. Flight costs: A roundtrip flight from LAX to Seattle is currently about $170 if you book in mid-August, depending on the length of your stay. Lodging: Although the average price of a hotel for a couple fetches around $184, you can save more money if you use a hostel or Airbnb. For instance, some hostels are available to book for around $45 per person if you search through TripAdvisor. What to do: Spend a day hanging out at the beach on the west side of Seattle or take in the state’s beautiful nature with a free walking tour. Or spend some quality time with your partner on a ferry to see the city at once. Washington has the fourth-largest ferry system in the world so be sure to take advantage. Married: $1,500 — Lexington, Ky. Flight costs: You might have to fly across the country for this trip, but at least you won’t have to worry about breaking the bank for a flight. Roundtrip flights from LAX to Lexington, Ky. are currently as low as $374 for a weeklong stay in August, according to Google Flights. Lodging: Even though the average price of a hotel for a couple is already pretty low at $33, you can book a hostel for $16 per person, according to BudgetYourTrip. What to do: Since Lexington is heavily associated with bourbon, you could take a bourbon tour or check out one of the famed distilleries such as Castle & Key. Flight costs: Booking a flight toward the fall and early winter is your best bet in saving money traveling overseas. Roundtrip flights to Lisbon in November and December are currently available for as low as $691 if you depart from LAX. But during the summer months, you’ll be looking at paying more than $1,000 for the same trip. Lodging: The average price of a hotel for a couple is $91. But if you’re looking to snag an even better deal to have a much more affordable vacation, you can use Airbnb to book a room according to your price range. What to do: While on your romantic getaway, explore some of the city’s restaurants or hop on the famous Tram 28, which will take you through the beautiful hilly Alfama neighborhood. But be mindful that it typically costs $100 a day to travel through the city. Flight cost: Las Vegas is actually a good travel destination for families as well as for partygoers. For instance, a roundtrip flight to Las Vegas from LAX is currently $83 per passenger for a four-night stay. Lodging: Although Las Vegas might be known for its extravagant and pricey hotels like the Wynn and the Palm, there are hotel rooms available for four people that are affordable. When you search through TripAdvisor, you can book a hotel room for as low as $280 for four people staying a week. What to do: Try indoor skydiving with prices starting as low as $75 or get out of the Las Vegas strip and take a ride on the High Roller, the world’s largest observation wheel. Flight cost: Currently, a roundtrip flight to Salt Lake City from LAX is $117 for a 4-night stay in late August. Lodging: Using Kayak, you can find a hotel as low as $87 for two adults and two children. What to do: You can’t have your family trip in Salt Lake City and not see the Great Lake. At 1,700 square miles, it is the largest natural lake west of the Mississippi River, according to U.S. News. Also, during the winter, make sure to visit a Salt Lake City staple, the Snowbird Ski & Summer Resort. Depending on age and time of day, tickets can range from $17 to $139 for ages 6 and up. Family of Four: $2,000 — Portland, Ore. Flight costs: Roundtrip flights to Portland out of LAX are currently about $160 to $180 a person, which is perfect if you’re looking to travel out of state. Lodging: Instead of renting a hotel, which could get pretty expensive, try to book an Airbnb. Rent out a whole house or condo on Airbnb starting at $92 a night. What to do: Check out the many parks and gardens that are typically free and a great way to bond with family. Also, if you’re in Portland long enough during your stay, take a walk through the Portland Saturday Market where you can rub elbows with locals and get a taste of the Portland life. 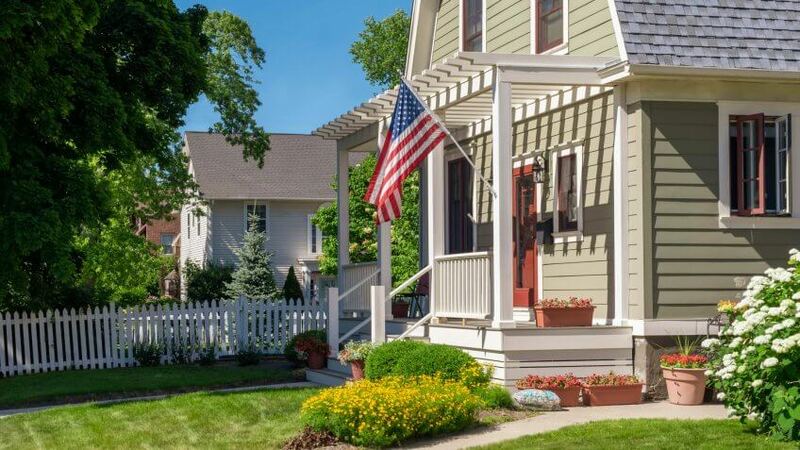 Click through to read more about the best places in every state to get a vacation home. All flight information was sourced from Google Flights for the month of August 2018 unless noted otherwise. These attractions cater to people with disabilities.